With the weather finally on the warmer side, plant and animal activity at James Farm Ecological Preserve awakens! Observant visitors will notice the spots of blue-purple in the brown mowed grasses of our meadows. 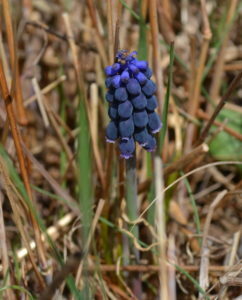 This is the grape hyacinth, often cultivated in our gardens and lawns. Thousands of these single stalked flowers are scatted throughout our meadows. The first butterflies are flying. An occasional “Blue,” or the reddish-orange “American Copper” flit about our feet along the mowed trail from the parking lot kiosk to the educational shed. See one and you may see two or more chasing each other. These sightings are fleeting as the spring breezes whisk them away just as we try to get a closer look as they rest on a raised blade of grass and flex their wings. They flit away, fly about and then return to the same general area where first observed. The common European White, the cabbage butterfly, is the first to be seen in the spring, moving swiftly over the meadow and hedgerows, landing at cryptic flowers for nectar or to lay an egg. From left to right: European White, Painted Lady, Tiger Swallowtail and Buckeye. From Dennis’ personal collection. Tune your ear to the droning of the occasional bumblebee flying swiftly about. They also are ground nesters and are looking for good housing areas in the leaf litter and investigate sources of pollen and nectar. Soon to come are the Painted Ladies, Tiger Swallowtails and Buckeyes. 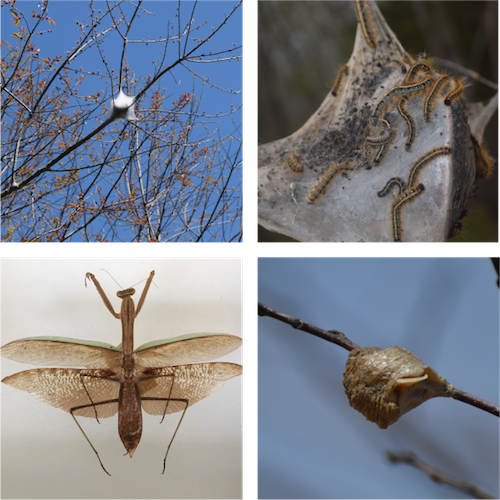 As our Black Cherry trees burst their buds and sprout leaves, look for the cottony nest of the Eastern Tent Caterpillars. Also check out the branches of our trees in the meadow on the eastern side of Cedar Neck Road. The “styrofoam” like egg masses can be seen silhouetted against the blue sky, waiting for the spring plant growth and warm weather to release the small nymphs of the Chinese Mantis that we see on our meadow plants throughout the summer and fall. 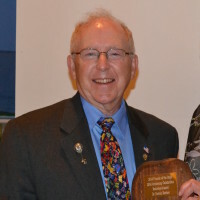 Dr. Dennis Bartow is one of the CIB's most dedicated volunteers who organizes and participates in numerous projects including the annual Inshore Fish and Horseshoe Crab surveys, and cleanup events. He also teaches with the CIB's James Farm Middle School Program and is a member of the Citizen's Advisory Committee. Before volunteering with us, Dennis spent 39 years as a teacher and administrator in Pennsylvania, middle school and high school teacher of life sciences, assistant principal, and director of instruction services for the the local school district. This entry was posted in Staff Blog and tagged bugs, creepy crawly, habitat, insects, james farm. Bookmark the permalink.